If Thursday night's underwhelming Tesla Model Y reveal was in any way supposed to distract analysts and the company's critics from its cash balances, it failed. Worse, the fact that the car won't be delivered to customers for another year and a half had analysts and some in the media, like Bloomberg's Dana Hull, noting "rekindled concerns about the company’s cash position." The Model Y is set to start being delivered in the Fall of 2020, which is later than some analysts expected. And in a sign that Tesla is increasingly liquidity-constrained, the company started taking $2,500 pre-orders, more than twice the $1,000 it asked for to reserve a Model 3. Interestingly, one Twitter sleuth noted that the $2,500 isn't technically a deposit, but rather that it goes toward "processing costs". Toni Sacconaghi, an analyst with Sanford C. Bernstein Co., commented Friday: "More expensive customer deposits for Model Y are likely to reinforce bear concerns about Tesla’s cash. We expect initial orders to be notably lower than Model 3." The "standard" version of the Model Y, priced at $39,000, is slated to be available in Spring of 2021 - about two years away. 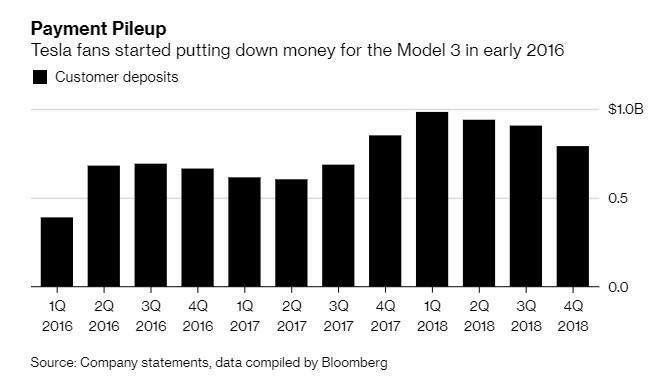 Meanwhile, as we noted during Telsa's most recent earnings call, customer deposits at Tesla are dwindling. Michael Harley, executive editor of Kelley Blue Book echoed our observations about the reveal, saying: "He was not the usual charismatic Elon Musk. He was super low-key. He was almost apologetic. It was a bit of a reality check. People in the crowd like the car, but Musk only spent a fraction of his time talking about it." Another well known name in the industry, Edmunds, called the Model Y "not a true SUV", but rather a "slightly-raised Model 3". We described the event as "a bomb of a presentation" after watching Elon Musk mumble his way through the reveal that started fifteen minutes late and ended with a vehicle that looked suspiciously like the Model 3. 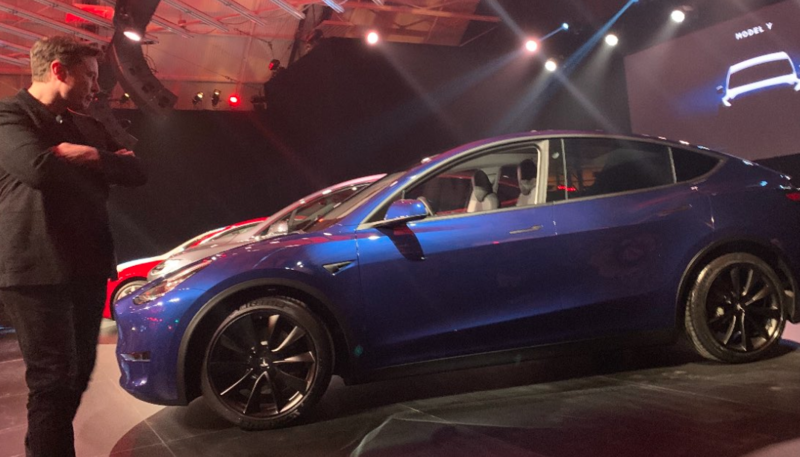 The Model Y, to put it lightly, seemed to be met with a tepid reception, not just from the crowd at the event, but also by Musk himself, who seemed none too enthused to be introducing it.